The Festival of Love was one of the festivals of the pagan Romans, when paganism was the prevalent religion of the Romans more than seventeen centuries ago. In the pagan Roman concept, it was an expression of “spiritual love”. Saint Valentine is a name which is given to two of the ancient “martyrs” of the Christian Church. It was said that there were two of them, or that there was only one, who died in Rome as the result of the persecution of the Gothic leader Claudius, c. 296 CE. In 350 CE, a church was built in Rome on the site of the place where he died, to perpetuate his memory. When the Romans embraced Christianity, they continued to celebrate the Feast of Love mentioned above, but they changed it from the pagan concept of “spiritual love” to another concept known as the “martyrs of love”, represented by Saint Valentine who had advocated love and peace, for which cause he was martyred, according to their claims. It was also called the Feast of Lovers, and Saint Valentine was considered to be the patron saint of lovers. The Christian clergy reacted against this tradition, which they considered to have a corrupting influence on the morals of young men and women. It was abolished in Italy, where it had been well-known, then it was revived in the eighteenth and nineteenth centuries, when in some western countries there appeared shops which sold small books called “Valentine’s books”, which contained love poems, from which the one who wanted to send a greeting to his sweetheart could choose. They also contained suggestions for writing love letters. It was also said concerning the origins of this holiday that when the Romans became Christian, after Christianity had become widespread, the Roman emperor Claudius II decreed in the third century CE that soldiers should not get married, because marriage would distract them from the wars they used to fight. This decree was opposed by Saint Valentine, who started to perform marriages for the soldiers in secret. When the emperor found out about that, he threw him in jail and sentenced him to execution. In prison, he (Saint Valentine) fell in love with the jailer’s daughter, but this was a secret because according to Christian laws, priests and monks were forbidden to marry or fall in love. But he is still regarded highly by the Christians because of his steadfastness in adhering to Christianity when the emperor offered to pardon him if he forsook Christianity and worshipped the Roman gods; then he would be one of his closest confidantes and he would make him his son-in-law. But Valentine refused this offer and preferred Christianity, so he was executed on 14 February 270 CE, on the eve of February 15, the festival of Lupercalis. So this day was named for this saint. It was narrated that ‘Adiy ibn Haatim said: “I came to the Prophet (peace and blessings of Allaah be upon him) wearing a gold cross around my neck. He said, ‘O ‘Adiy, cast aside this idol.’ And I heard him reciting from Soorat Baraa’ah [al-Tawbah] (interpretation of the meaning): ‘They (Jews and Christians) took their rabbis and their monks to be their lords besides Allaah.’ He said: ‘They do not worship them, but when they permit them something they accept it as permitted, and when they forbid them something they accept it as forbidden.’” (Narrated by al-Tirmidhi and it is a hasan hadeeth). 1 – Expressing joy and happiness on this occasion, as on their other major festivals. 2 – Exchanging red roses, which are an expression of love, the “spiritual love” of the pagans or the “love” of the Christians. Hence it is known to them as the Feast of Lovers. 3 – The sending of greetings cards. On some of these cards are pictures of “Cupid”, who appears as a child with two wings, carrying a bow and arrows. This was the god of love of the pagan Romans – exalted be Allaah far above their fabrications and their association of others with Him. 4 – Exchange of words of love and desire in the greetings cards which they send to one another, in verse, prose and short phrases. Some of the cards contain comical pictures and funny words, and they often contain the phrase “be my Valentine”. This represents the Christian concept of this festival after it was taken from the pagan concept. 5 – In many western countries, parties are held during the day and in the evening, where there is mixing of men and women, and dancing. Many of them send gifts such as roses and boxes of chocolates to their wives, friends and those whom they love. That the development of this festival among the Romans was connected to myths and legends which no sound mind can accept, let alone the mind of the Muslim who believes in Allaah and His Messengers (peace be upon them). Can anyone of sound mind believe that a she-wolf suckled the founder of the city of Rome and gave him strength and wisdom. Moreover, these myths go against the belief (‘aqeedah) of the Muslim because the One Who bestows strength and wisdom is the Creator, may He be glorified and exalted, not the milk of a she-wolf! The same applies to the myth that their idols could protect them from evil or keep wolves away from their flocks. Thirdly: Among the ugly rituals of the Romans on this day was the sacrifice of a dog and a goat, the daubing of their blood onto two youths then washing the blood off with milk, etc… This is something that would cause revulsion in anyone of a sound nature, and it is unacceptable to the sound mind. The connection between Saint Valentine and this festival has been questioned by many sources, and it considered to be far from definite. It would have been better for the Christians to reject this pagan festival in which they imitated the pagans. So how about us Muslims, who are commanded to be different from the Christians and the pagans before them? Fifthly: this festival was denounced by the Christian clergy in Italy, the bastion of Catholicism, because it was spreading bad attitudes and having an adverse effect on the minds of young men and women. So it is better for the Muslims to reject it, warn others against it and to fulfil their duty towards it of enjoining what is good and forbidding what is evil. Someone may ask: why do we Muslims not celebrate this festival? 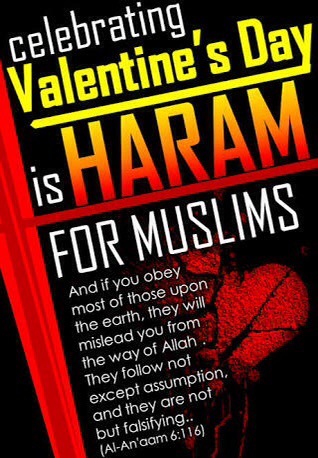 Because Valentine’s Day goes back to Roman times, not Islamic times, this means that it is something which belongs exclusively to the Christians, not to Islam, and the Muslims have no share and no part in it. If every nation has its own festivals, as the Prophet (peace and blessings of Allaah be upon him) said – “Every nation has its Eid” (narrated by al-Bukhaari and Muslim) – then this means that every nation should be distinguished by its festivals. If the Christians have a festival and the Jews have a festival, which belongs exclusively to them, then no Muslim should join in with them, just as he does not share their religion or their direction of prayer. 2. Celebrating Valentine’s Day means resembling or imitating the pagan Romans, then the Christian People of the Book in their imitation of the Romans in something that was not a part of their religion. If it is not allowed to imitate the Christians in things that really are part of their religion – but not part of our religion – then how about things which they have innovated in their religion in imitation of idol-worshippers?! Allaah has forbidden imitation of the kuffaar; He has described it as hateful and has warned against the consequences of that, in many aayahs, on many occasions, and in various ways, especially imitation of the kuffaar. Sometimes He does that by forbidding following them or obeying them; sometimes by warning against them or being deceived by their plots, following their opinions, or being influenced by their actions, conduct or attitude. Sometimes He does that by mentioning some of their characteristics that will put the believers off from them and from imitating them. Most of the warnings in the Qur’aan refer to the Jews and hypocrites (munaafiqeen), then the People of the Book in general and the mushrikeen. Allaah tells us in the Qur’aan that imitating and obeying the kuffaar may constitute riddah (apostasy). Allaah also forbids following them, obeying them, or following their whims and desires and bad characteristics. “This day, I have perfected your religion for you, completed My Favour upon you, and have chosen for you Islam as your religion”[al-Maa’idah 5:3 – interpretation of the meaning]. Allaah has made Islam cover all (human) interests at all times and in all places and for all people. So there is no need to adopt the ways of the kuffaar or imitate them. Imitation causes defects in the Muslim personality, such as feelings of inadequacy, inferiority, weakness and defeatism, then it leads to shunning and keeping away from the path and laws of Allaah. Experience has shown that admiration for the kuffaar and imitation of them causes people to love them, have complete faith in them and take them as friends and helpers, and to reject Islam and its people, its heroes, its legacy and values, and become ignorant of all of that. Shaykh al-Islam Ibn Taymiyah (may Allaah have mercy on him) said: “Allaah tells us that there is no believer who takes a kaafir as a close friend. Whoever takes a kaafir as a close friend is not a believer. Outward imitation may be taken as a sign of love, so it is haraam.” (al-Iqtidaa’, 1/490). 4. The love referred to in this festival ever since the Christians revived it is romantic love outside the framework of marriage. The result of that is the spread of zinaa (fornication and adultery) and immorality. Hence the Christian clergy opposed it at some stage and abolished it, then it came back again. Most of the young people celebrate it because it lets them fulfil their desires, without thinking of the issues of imitation and resembling that are involved. Look at this tragedy, where they go so far as to commit major sins such as zinaa and the like, by imitating the Christians in something which is part of their worship and which may even be kufr.